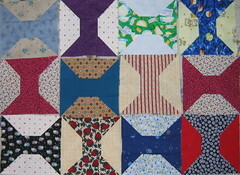 Lucy's Quilts: Too Busy to Post? The week started out well with this little beauty arrving all the way from the Netherlands from laplandyellow. 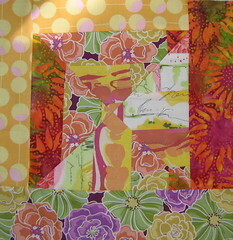 It is one of my June blocks from the Quilt Block Exchange. Here is the block I got finished for laplandyellow and will get in the mail as soon as I get to the post office. I traveled across the state yesterday at the request of my grandson. He has been needing his Grammy and who am I to argue with that? He was very excited to see me yesterday and even more excited when he saw all the strawberries I brought with me. Before I left I also got the last of the spool blocks done so they are ready for craft night next week. As I made these spools I got 4 HSTs from each that I made into broken dishes blocks. I decided to haul out all my random orphan blocks and see what I had and what I might be able to make from them. 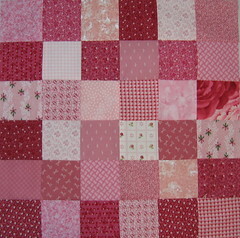 Sorting them out gave me 4 doll quilt tops to put together. I got the tops done and I am going to ust back them with flannel with no batting since I hope to sell them at a bazaar as, interestingly enough, doll blankets for little girls (or boys) to play with. I figured that makes them a little easier to wrap around a doll. I quilted two of them on the machine and got their bindings on them ready for the hand-sewing and the other two will be hand quilted using embroidery floss. I brought these all along since I get the occasional break from the kids to do a little hand-sewing.